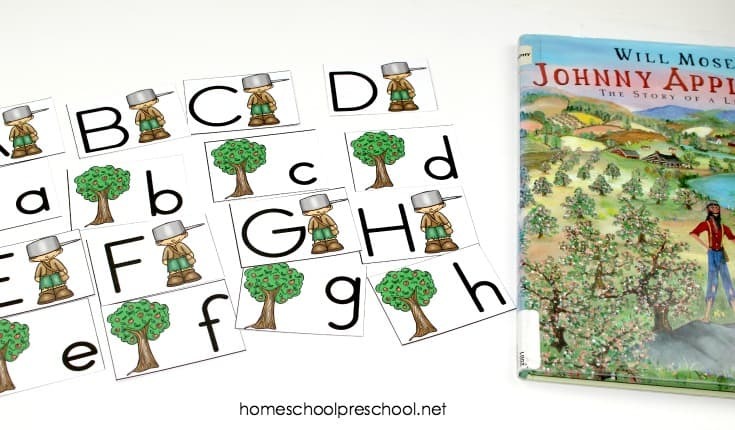 Whether you’re celebrating Johnny Appleseed Day or supplementing your apples preschool theme, don’t miss this free Johnny Appleseed preschool activity pack! Johnny Appleseed is a fascinating fellow. 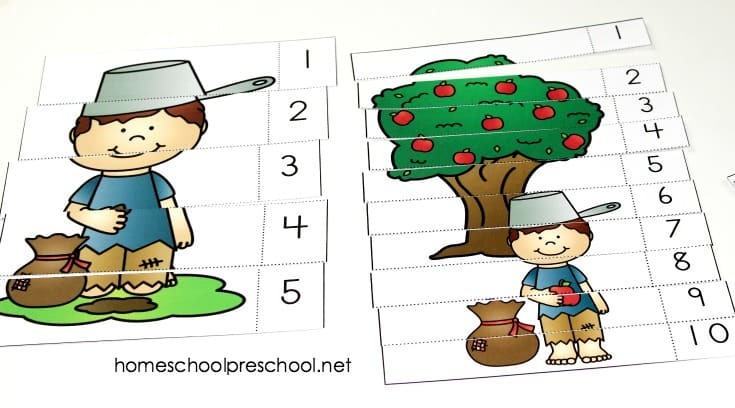 What kid wouldn’t want to learn about a man who traveled out west planting appleseeds while wearing a tin pot for a hat. 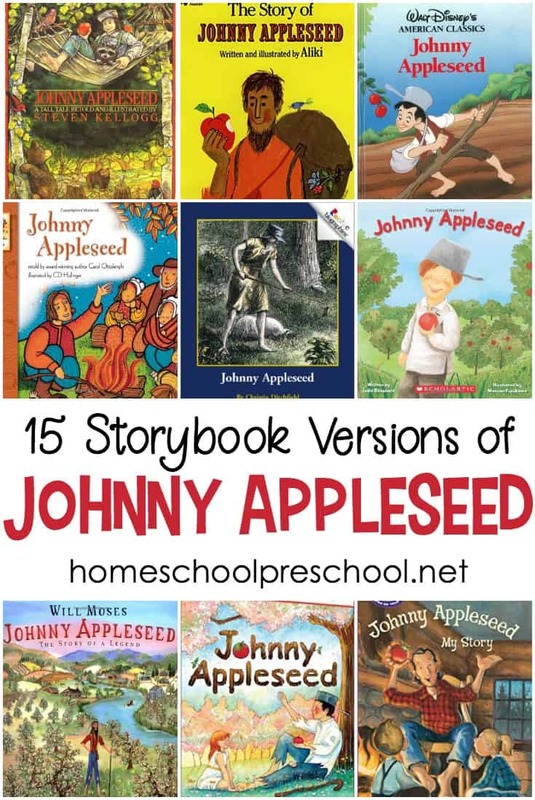 There are so many activities you can do to learn more about John Chapman, AKA Johnny Appleseed. 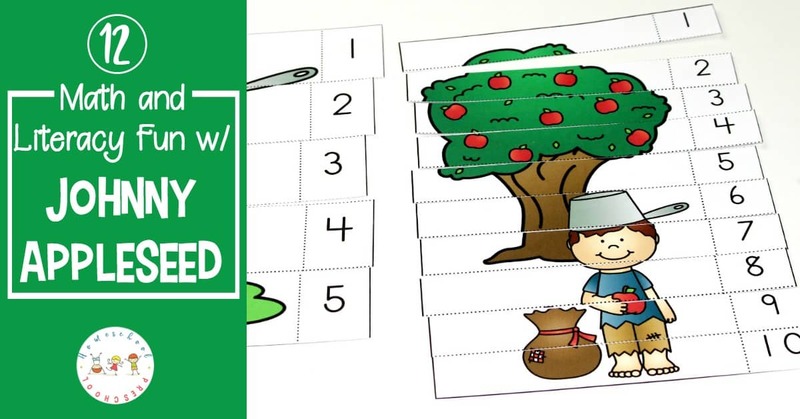 This pack is full of activities that feature apples and Johnny Appleseed. From counting and handwriting to I Spy and a fun maze, you’ll find these activities and more in the printable pack that you can download below. I love low-prep and no-prep activities. 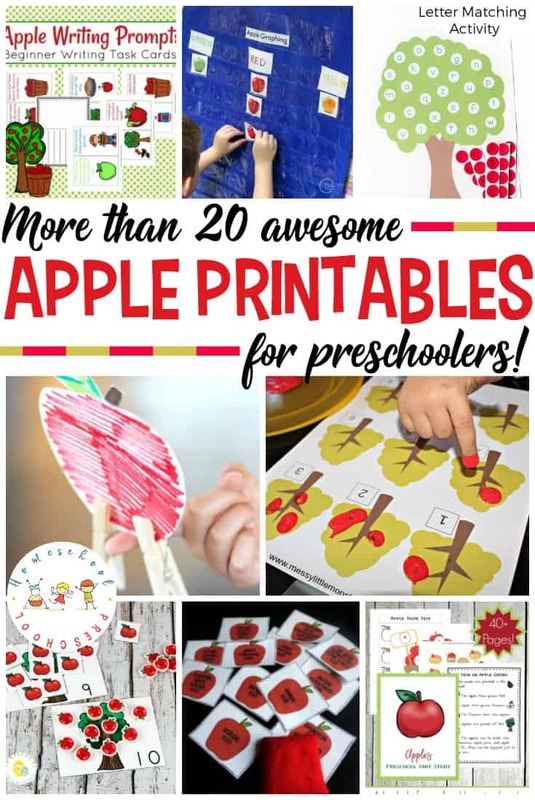 They’re quick and easy to put together for busy preschool moms and teachers. And this pack is full of both! 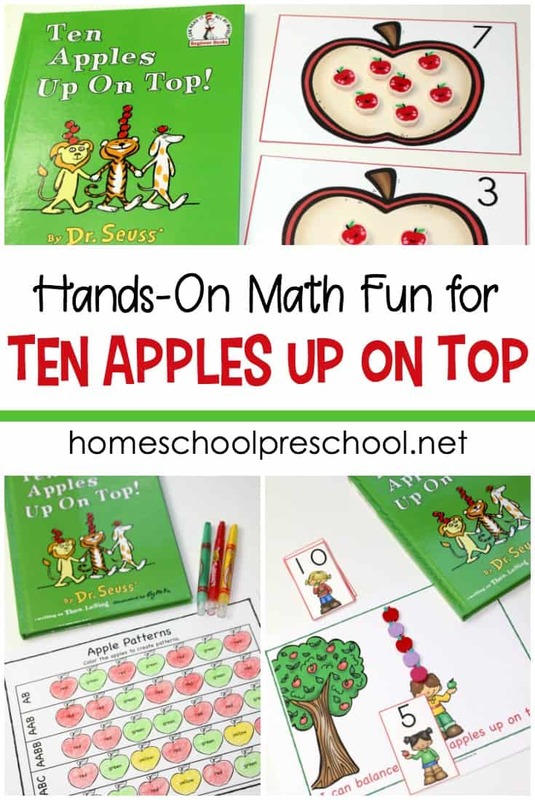 With a variety of math and literacy activities, you’ll have many activities to choose from as you introduce these pages to your preschoolers. Alphabet matching cards are great for so many things. Your preschoolers can work on letter recognition, matching uppercase and lowercase letters, and ABC order. I suggest printing these pages on cardstock and laminating for durability. You can also punch a hole in the top left corner of each card and clip them together with a binder ring. Once they’re clipped, you can store them on a hook in your literacy center or pop them in your purse for practice on-the-go. Number puzzles help little ones learn to recognize numbers and put them in order. This packet contains puzzles for counting 1-5, 1-10, and 11-20. As with the ABC cards, I suggest printing these puzzles on cardstock and laminating for durability. 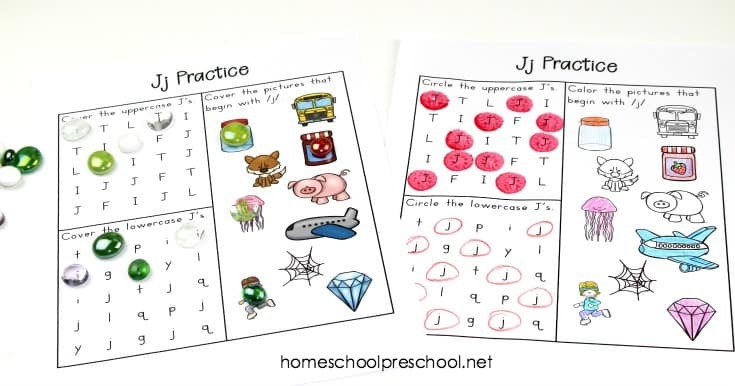 On this worksheet, kids will search for the letters J and j among a larger set of letters. They’ll also search for pictures that start with the /j/ sound. This page is available in both color and black/white for those who want to save ink. I love providing preschoolers with storytelling props. There are so many ways to use them, and they’re super simple to assemble. Print the page on cardstock, laminate, and glue to a craft stick. Then, you’re ready to go. 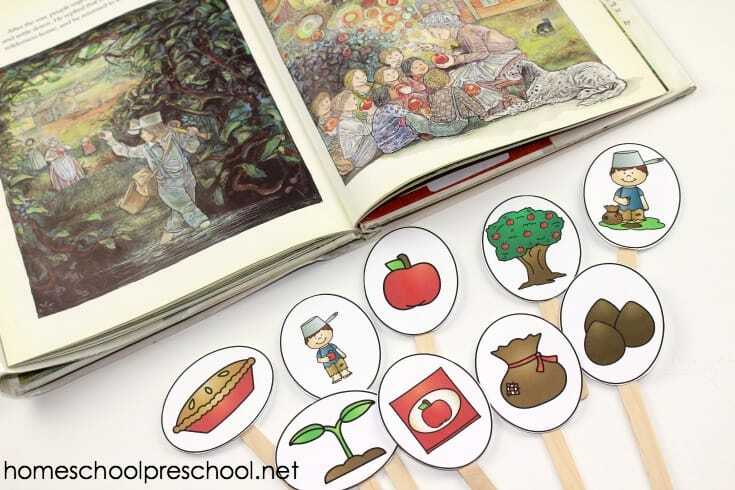 Kids can use them for story sequencing practice and for imaginative play. Stick them in a sensory bin for even more creative play ideas. 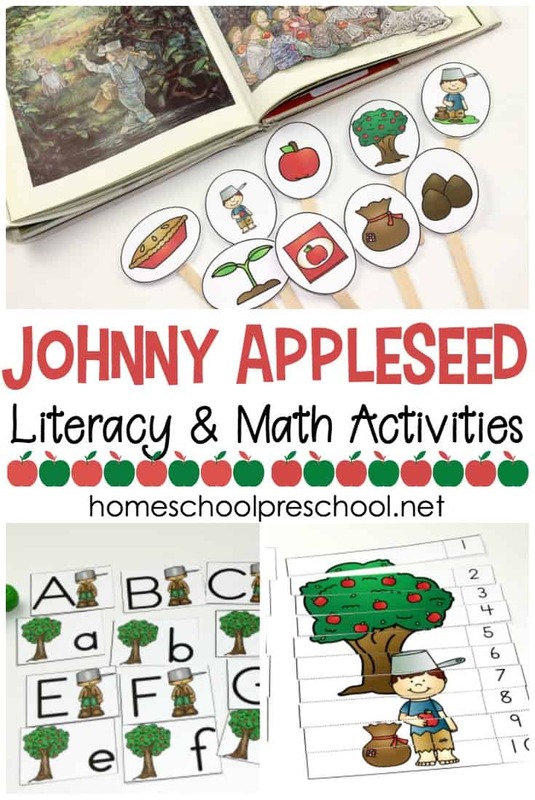 You can find these activities and more (there are 12 activities in all) in my Johnny Appleseed Preschool Pack.